THIS IS NOT MY CREATION! What you see above is the Ultimate pinball machine (Star Trek: The Next Generation) gutted and destroyed. You are asking yourself how could this happen? Was there something I could do? 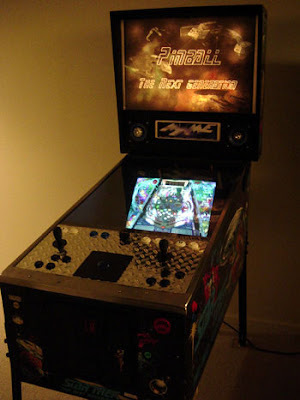 Probally not, but you can get revenge for this poor machine and for Steve Ritchie who put it blood sweat and tears into the best damn pinball machine in my opinion. So many pinball collectors search high and low for this machine, and to see one so carelessly destroyed makes them sick! I don't know who did this, but when I do I will give them a piece of my mind!